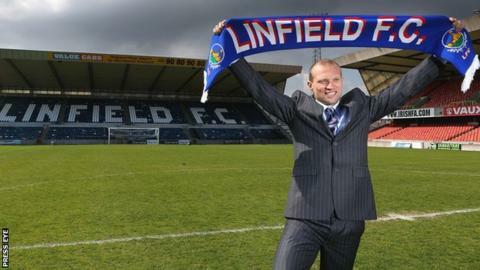 Warren Feeney is determined to bring the glory days back to Windsor Park as he begins his reign as Linfield boss. The former NI striker, who has signed a two-year-deal, was unveiled as David Jeffrey's successor on Tuesday. "The culture here is all about winning trophies - I want to bring more success here," said the 33-year-old. The 39-year-old is the son of former England international defender Colin Todd. "Colin's got a great football brain and he's someone I trust immensely," added Feeney. "He's a deep thinker about the game and it came as no surprise to me when he told me that he had done his research about Linfield before he agreed to come on board." Feeney's former clubs include Bournemouth, Stockport County, Luton Town, and Plymouth Argyle. The boyhood Linfield fan, who made 46 appearances for Northern Ireland, is considering registering himself as a Blues player. Linfield finished second in the Premiership this season behind Cliftonville, who lifted the Gibson Cup for a a second year in a row. "This is the biggest club in Ireland and it is in my blood. I would not have come home for any other job," said Feeney. "Cliftonville are a strong squad but I want to focus on Linfield and what I can bring to this club. "I am well prepared for this job and think I am ready for it - I want to sign the best players and I have the contacts to do that and I haven't decided whether to continue playing myself. "As soon as I heard that David was stepping down I knew that this was the job for me. What he has achieved here is phenomenal and I will be speaking to him."